Nothing inspires fear and obedience in your minions like appearing before them as a giant floating head. Just ask the Wizard of Oz. Now the middle managers of the world can pretend they are great and magnificent with the advent of a hologram system that allows you to teleconference in awe-inspiring 3D. ICT Graphics Lab displayed this new system at their booth at SIGGRAPH earlier this summer. Just like in Oz, a person was able to sit behind a curtain and appear before viewers via special cameras, a projector and a spinning mirror. The effect is wonderful, and sometimes hilarious. The Wizard of Oz? Emperor Palpatine? Jambi from Pee-wee’s Playhouse? No, that’s just Andrew in accounting. While holographic teleconferencing may be a wonderful application of this technology, the effects could be seen in a far wider arena. 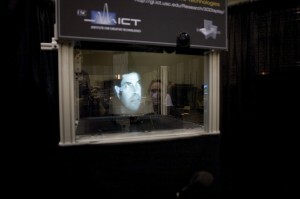 ICT can broadcast your face in real time, but they can also do the same with almost any image. Pre-recorded images can be rotated and manipulated and viewed in a full 360° arc. The possibilities for modeling and sharing 3D images are amazing. You can also scale large recorded images (like someone’s full body) down to fit in the head-sized viewing area. Hopefully we’ll see this scaling incorporated into the teleconferencing system. 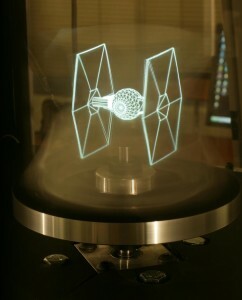 How cool would it be to have real Star Wars style communication in your home or office? While some may define true holography as involving phased laser light, ICT took a somewhat simpler approach. The secret is an A-frame made of two slightly concave mirrors and a really smart timing algorithm. Project an image onto a mirror and it appears at some point in space. Rotate the mirror and you can trace that point in a full 360° arc. Rotate fast enough, and each point in space can have multiple images shown per second. Basically each point in space gets its own simple animation. With the right timing, you can show the left eye and right eye slightly different images and make an object appear in 3D. Sounds complicated, looks awesome. For real-time teleconferencing, a person sits in front of a few cameras. These cameras can develop a 3D image of someone using some special lamps that illuminate the face with a wave pattern. If you’re really interested in the technical aspect of it, the third video explains it pretty well. Suffice to say that the combination of lighting and cameras allow someone to appear as a 3D hologram without using a true 3D scanner. This makes the conferencing faster so you don’t have a lag between the adoring public and Max Headroom. Now, while ICT has managed to create a great way of viewing a 3D image, the use of a high speed rotating mirror has negated any possibility of getting close to the hologram. I’d really love to see the combination of the tactile holography we discussed before (also seen at SIGGRAPH) and 3D object projection as seen with ICT. That would open up a really great opportunity for full-body holographic telepresence. Right now, however, trying to touch an ICT image would likely get your finger chopped off. Not so good. Also, while the teleconference head can make eye-contact, which is huge, it is still prone to glitches. Vertical tracking allows people at different heights to see the corresponding correct portion of the face, but see if you notice how certain parts of the face seem to cut in and out during the videos above. ICT may need some upgrades in computer processing speeds and projector resolution before these artifacts are corrected. While ICT’s head hologram has some amazing features that far exceed traditional teleconferencing, I’m not sure it’s going to catch on. You need a special setup and special recording equipment to get it to work. It may be a select few who are willing to make such an investment when you can use a $150 monitor and a $50 webcam to accomplish a 2D version. The 360° image viewing may catch on for object modeling, but again, that’s not a guarantee. I think the biggest promise of this technology may be that it shows how many approaches there are to creating realistic 3D images. Some day we’re going to have lifelike real time holograms – there’s too many paths for them all to fail. Which is good news for those of us who have underlings we need to impress. Come my Singularity Hub interns, gaze upon my floating head and FEAR ME!